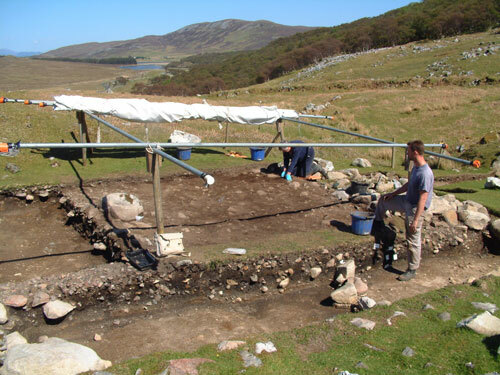 Excavations have now been underway at the High Pasture Cave site for the past 5 weeks. The weather has been rather unsettled at times, but we have had some dry and sunny days of late with cool winds. After completing our initial preparations at the site, including the removal of tarpualin covers and cleaning of trenches and open sections, we continued with our excavations in Trenches 14, 15 and 19. Work in these trenches has included extending the limits of our excavations to investigate features and stratigraphic relationships, to enable us to understand with more certainty site function and formation processes. A view of the natural hollow immediately outside the cave and stairwell entrance to Bone Passage. 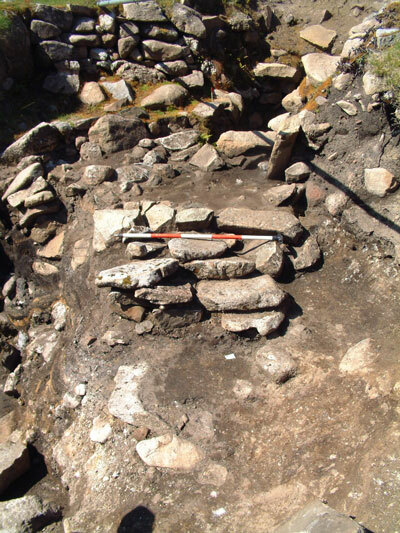 The stairwell entrance is to the right in this image, with the access steps leading up to the upper landing, while Kath Small can be seen excavating in the walkway that pre-dates the construction of the stairwell. The sequence of labels are indicating the complex stratigraphy we have been excavating relating to the sequence of hearth settings and archaeological deposits that fill the natural hollow. 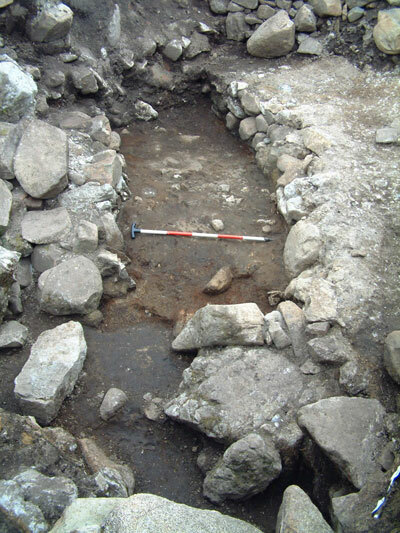 The image below shows the same view after the landing at the head of the stairwell had been cleaned ready for excavation. 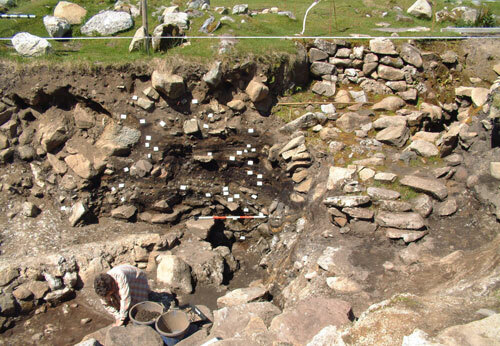 Excavations will remove the east side of the stairwell in 2009 to investigate phasing in the structure and to enable us to link the stratigraphic units within and outside the cave. Removal of the deep deposits remaining outside the stairwell will also allow us to reveal more of the walkway that pre-dates the construction of this feature, if this still survives. 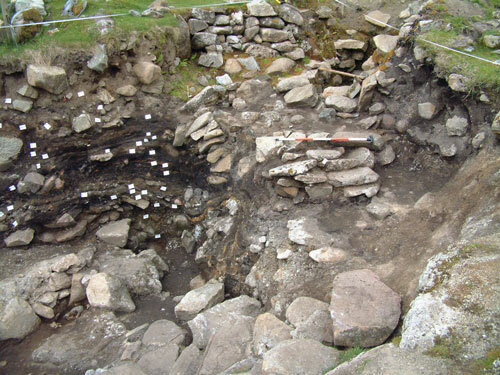 The image above shows the walkway from the north (from the stairwell landing) and the deep archaeological deposits to the south, which we will be excavating in 2009. This will allow us to investigate access to the walkway within the natural hollow and other potential features in this part of the site. The image below shows the walkway from the south, the stairwell landing and the deep deposits below. Note the white crushed limestone surface to the left of the walkway, which contains a small slab-built hearth. 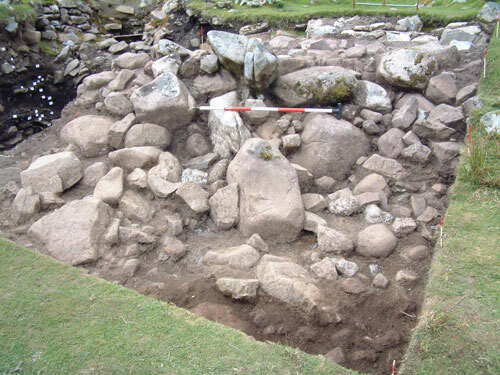 Excavations of the deep archaeological deposits above the south end of the walkway have started to reveal a jumble of stonework, some of which is backfill material, and hints of possible wall lines. Small finds already recovered from this area includes bronze wire and a broken bronze disc of thin wall section, and several pottery sherds. Images of some of these finds will be posted soon on the website. 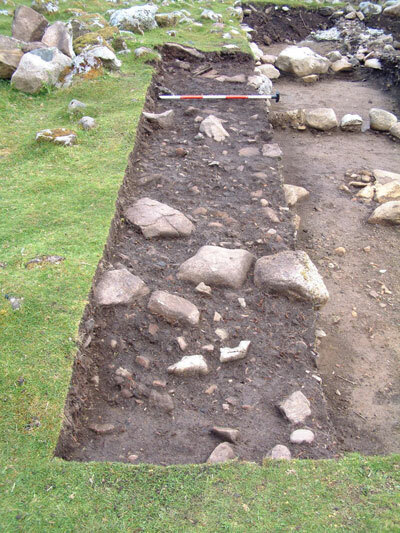 Trench 15 from the south showing the stone fill and potential features, after removal of the turf and initial excavation. Excavation of the stone-built stairwell accessing Bone Passage has also started. Already, carefull excavation of the upper landing and the archaeological deposits immediately below, have revealed a second landing. The image below shows the upper/first landing after initial cleaning. A sequence of steps can be seen leading up and onto the upper landing, with the entrance to the stairwell beyond. 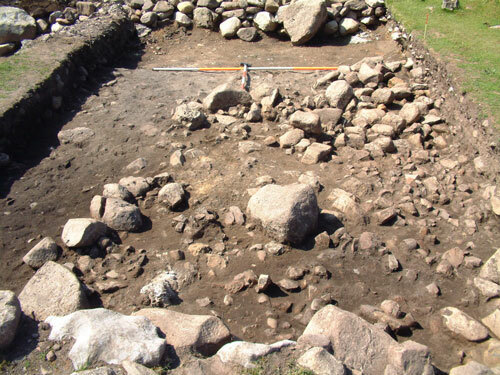 Additional excavation of the landing revealed thin granite slabs set on edge that define the limit of the landing (see image below). In this image, the stairwell entrance is to the right and access steps to the landing to the left. Removal of the slabs, the sediments they retained and the top two steps of the stairwell revealed a second landing. 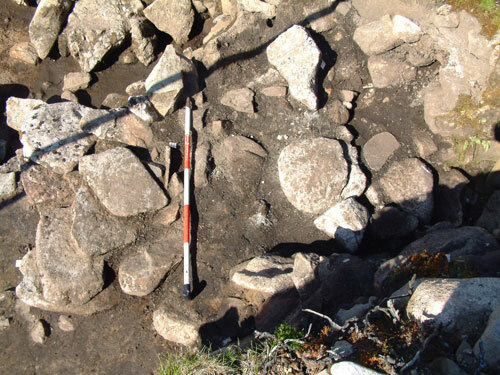 This included large granite and limestone paving slabs linking the access steps with the steps leading down the stairwell and this initial evidence from the excavations suggests that the stairwell was most likely built in several phases, potentially has the deposits accumulated in the natural hollow outside the cave entrance. 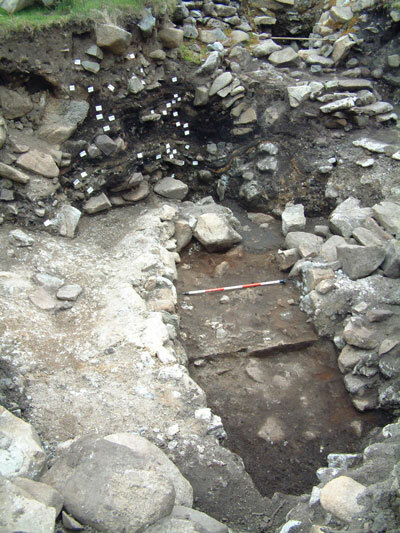 This would have retained access to the cave (see image below showing the second landing after excavation with access steps to the left and stairwell entrance to the right). Excavation of the stairwell will be a slow process, which will also include 100% wet-seiving of the excavated archaeological deposits to extract the maximum amount of information. This has already produced several sherds of pottery and a significant amount of burnt barley grain. Elsewhere on site, we have also continued our investigations of the burnt mound in Trench 19 and the earlier features we have started to identify pre-dating the formation of this feature. We have extended Trench 19 to provide a larger open area excavation, so that we have the opportunity to relate features and their potential function. 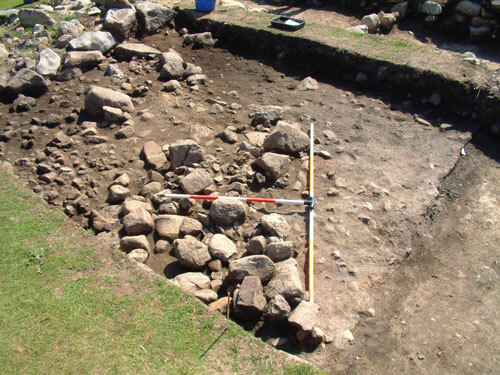 The image below shows one of the two extended areas of the trench after removal of the turf and cleaning to reveal the top of the burnt mound deposits. 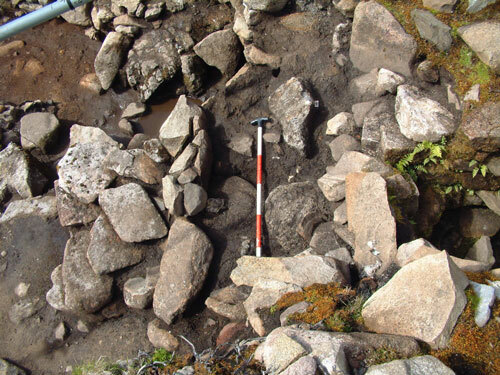 Excavation of the upper burnt mound deposits has produced significant quantities of burnt stone, pottery sherds, stone tools and a number of slag deposits. We have recovered a significant amount of iron slag and two plano-convext hearth bases from Trench 19 to date, indicating that this area has received re-deposited material from a nearby smelting or smithing area at the site. The image above shows the smaller extension to Trench 19 (on the south side of the trench), from which we have recovered iron slag deposits. Removal of the upper burnt mound material in Trench 19 has revealed complex deposits including areas of compacted burnt mound, charcoal rich sediments with little burnt stone, and unburnt granite stones - some of which appear to be forming ephemeral structures that will be investigated further during our ongoing excavations (see images below).